Four Florida panthers just moved into their new residence at Busch Wildlife Sanctuary in Jupiter, and they couldnât be happier. âThey love it,â says David Hitzig, the sanctuaryâs Executive Director. âItâs great to see the panthers in their new habitat. This project wouldnât have been possible without the generosity of the family at Casto Homes and people like them.â Casto Homes and their caring homeowners and friends helped finance and build this state-of-the-art habitat for the stateâs most iconic endangered species. 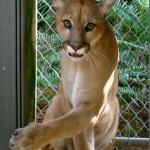 Florida is the only place east of the Mississippi with panthers, and itâs estimated that only 100 remain in the wild. So itâs critical to keep them safe and sound. The new enclosure has three separate play yards with watering holes and climbing structures. There are also six hurricane-safe night houses to accommodate the panthers currently living in the sanctuary and any additions. Most of the panthers are brought in by governmentÂ agencies as confiscated animals that were being kept in captivity illegally. âWeâre happy to have helped complete the residence because the panthers look so comfortable and happy in it,â says Jim Casto of Casto Homes. âBusch Wildlife is our favorite organization, and weâve also been involved in building the fox cage, welcome center and bear habitat, which is next to the panther habitat. Itâs a great facility.â The next project is already in the works. Casto Homes is helping to renovate the former panther habitat and turn it into a new residence for the bobcats at Busch Wildlife Sanctuary.